Egg Binding is the condition when a female can not pass an egg (either a fully developed or partially developed egg). Egg binding is usually caused by a dietary deficiency (calcium and other nutrients) though other factors can also play a part in it. Diet, stress, cold, excessive egg laying, age/size are all factors which should all be considered when treating and preventing egg binding. I will go into more detail with each of these factors in the prevention section. How will I know that my finch is Egg Bound? An egg bound finch will have the basic sick bird look with a few modifications. Usually the female stops eating or eats only a little. She may still defecate but probably only a little will get through if any at all. Her tail may be bobbing a bit or raised as the muscular contractions are trying the push the egg out. The wings will be down slightly and she'll have an overall look of exhaustion on her. Normally she'll sit on the floor the cage as they can loose their balance while pushing the egg out but you may find an egg bound inside her nest as well. I do have to say this, just so someone doesn't come back and tell me I wasn't laying out all the facts. A male finch will never become egg bound. This can physically only happen to females. I know it's silly and a no duh kind of fact but I needed to say it. An egg bound female will die if the egg isn't expelled in a short about of time. Usually by the time you notice the problem she only has hours left. Always be prepared to act quickly. How to I treat my Egg Bound hen? Remove the female from the cage she had been in. Give her one-drop of Calcium Plus directly in the mouth. She needs to swallow it. Then place her in a small brooder, hospital cage, or just a small spare cage. Use a heating pad to warm the cage. Try to keep the temperate between 80 and 85 degrees Fahrenheit. Use a dish of water for her to drink from and to add humidity to her environment. I usually drape a small towel over a few sides of the hospital cage to help keep in the warmth and humidity. Make sure there is food and water inside the hospital cage that is in easy reach from the floor. The female may not perch until the egg is out so everything must be accessible from the floor. All you need to do now is wait. Once she is in the hospital cage and has had her Calcium Plus leave her alone. The added stress if seeing humans on a regular basis while she's that vulnerable won't help matters. Usually the egg will be passed within 16 hours. After the hen has passed the egg she will look and act perfectly normal again but should rest and not allowed to breed again for awhile. I prefer to leave an egg bound hen in the hospital cage until I am sure she is finished laying her clutch. Most become egg bound on the first egg of the clutch. This means there are at least a few more eggs on the way. Once the clutch has been laid and the female has recovered (this may take a week) you may put her back in with her mate. I will recommend that you remove the nest and not encourage their pair to nest again for several weeks. It may be wise to continue giving the pair a little Calcium Plus for the next several weeks. Dosage information for giving Calcium Plus via the water is written on the bottle. What can I do to prevent or decrease the likelihood of Egg Binding? I will start with the factors that can cause egg binding and tell you how to prevent each one from developing into such a life threatening problem. Diet: A proper diet is very important and is usually at the root of problem with egg binding. Egg laying birds need a balanced diet. Seed and millet are good but there really should be more. Adding greens, fruits, hard-boiled egg, mealworms, and cuttle bone (or oyster shell) can help a lot. Please learn as much as possible about your species of finch to find the diet that best suits your birds. Granted, not all finches will eat everything that you give them so readily. This is where commercially produced egg food comes into place. I have been feeding my picky eaters Egg Food for quite some time now. It is a wonderful product and has most everything the finch needs to remain healthy. It can be given daily or as a treat once a week. 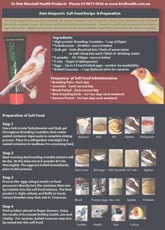 There are vitamin and calcium supplements that you can add to the finch's food and water. It is very important to know that if you buy a calcium additive for your finches to make sure it contains Vitamin d3. Vitamin d3 is necessary for the proper absorption of calcium. If your birds live in an outdoor aviary, they can make their own d3 via a chemical reaction to sunlight. 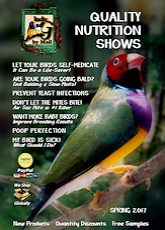 Birds living indoors don't get the full spectrum and ultraviolet light they need to produce d3 naturally. I like to use Calcium Plus or Breeding Aid. Both are great additives for any finches. Calcium Plus is mainly a calcium additive and Breeding Aid will contain the essential vitamins and fatty acids. 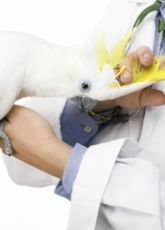 Stress: Having happy and healthy birds is always the way to go. Species vary on how well they adapt to unfamiliar surroundings, and general flightiness. The dog is barking, the kids are yelling, there are people moving around the cage all the time. How can a finch relax long enough to lay an egg with all this activity around the cage? Thankfully in the past few years I haven't seen much stress related egg binding, but when it does happen you do need to move your finches to a quieter part of the house. Some species also do better in small flocks or colonies and others are more comfortable in single pair breeding cages or flights. A finch that is severely stressed may pluck its feathers or other birds feathers, may be more aggressive, and may not eat well. Temperature/Dry air: Cold can be a problem in the winter months, and it is not only the cold but the over all dry air that compounds the problem. The muscles do not function and open properly when they are cold and dry. A simple heat lamp can fix this problem or just keep the temperature in your aviary room a little warmer. Adding humidity can be as simple as a festive tabletop water fountain for small groups of finches or add a humidifier to the room if you have a large flock. Age/Size: A small bodied hen is also quite likely to become egg bound if there isn't enough room for the egg to pass safely. Note that each species of finch has its own ideal size and weight. It's best to know what is the ideal size of your bird before you attempt breeding. Young hens may also have a problem with egg binding if they jump into breeding too quickly. They need time to mature and fully develop before they should be allowed to breed. 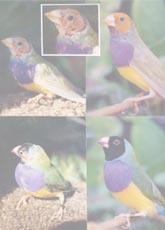 Finches tend to grow and mature very quickly and some aviary birds may start a new family before the hens are really ready. I don't condone breeding with young birds. I admit I have left a few juvenile Zebras in my aviary a little too long and they have bred, but the offspring were all small and just not as healthy overall as they would have been if their parents were older. Excessive Egg Laying: Simply laying too many eggs can cause egg binding. It depletes the body of nutrients and exhausts the female. I know many people think the egg just pops out, but it doesn't. I've watched some of my females lay eggs; they do go through a short labor before the egg is expelled. Afterwards they are hot, tired, and usually thirsty. Getting a female to stop laying eggs so it doesn't lead to egg binding can be a problem, many breeders give their finches fake or dummy eggs to sit on to end the laying. Some breeders simply remove the nest, but if even that doesn't work you will need to make sure her diet and light are excellent to keep her healthy. Allowing the pair to rest between clutches may reduce the likelihood of egg binding. Finches may not want to rest, they may even start laying eggs before the first clutch is fully weaned but it is best to remove any new eggs as soon as you see them. If the first clutch is weaning and not using the nest much I recommend removing the nest.